This tutorial is for the now ancient V1 Motor shield. Chances are you have a V2, check out the tutorial https://learn.adafruit.com/adafruit-motor-shield-v2-for-arduino This tutorial is for historical reference and previous customers only! Arduino is a great starting point for electronics, and with a motor shield it can also be a nice tidy platform for robotics and mechatronics. Here is a design for a full-featured motor shield that will be able to power many simple to medium-complexity projects. Full kit available for purchase from the Adafruit shop. Download the easy-to-use Arduino software libraries and you're ready to go! How many motors can I use with this shield? Can I connect more motors? No, at this time it is not possible to stack the shield or otherwise connect it up easily to control 4 steppers, for example. HELP! My motor doesnt work! - HELP! My motor doesnt work!...But the servos work FINE! Don't bother writing up uploading code or wiring up motors if the LED doesn't light up, its not going to work. What is the LED for? The LED indicates the DC/Stepper motor power supply is working. If it is not lit, then the DC/Stepper motors will not run. The servo ports are 5V powered and does not use the DC motor supply. Please read the user manual for information about appropriate power supplies. Can this shield control small 3V motors? What is the power connector on the shield for? How do I power my motors? My Arduino freaks out when the motors are running! Is the shield broken? Motors take a lot of power, and can cause 'brownouts' that reset the Arduino. For that reason the shield is designed for seperate (split) supplies - one for the electronics and one for the motor. Doing this will prevent brownouts. Please read the user manual for information about appropriate power supplies. I have good solid power supplies, but the DC motors seem to 'cut out' or 'skip'. What if I need more than 600mA per motor? You can subsitute SN754410's (at your risk) or piggyback solder some more L293D drivers on top of the existing ones. Which pins are connected to the DC/Stepper motors? The remaining pins are not broken out because they could be used by the motor shield. If you are sure that you are not using those pins then you can connect to them by using stacking headers when assembling the kit or soldering onto the top of the header with wires, or using a "Wing shield"
I get the following error trying to run the example code: "error: AFMotor.h: No such file or directory...."
How do I install the library? What are some 'suggested motors'? However, since its a popular question, I suggest buying motors from Pololu (DC Servos, DC motors) or Jameco (all sorts!) As well as the many surplus webshops. Is the motor shield compatible with the UNO R3 or Mega R3? What about the extra pins? The motor shield is compatible with the R3 UNO and MEGA. The R3s have 2 extra pins on each header. These are duplicates of other pins on the header and are not needed by the shield. I'm using a 4WD robot platform and I can't get anything to work. The motors used in the 4WD robot platforms from Maker Shed, DF Robotics, Jameco and others have a lot of "brush noise". This feeds back into the Arduino circuitry and causes unstable operation. This problem can be solved by soldering 3 noise suppression capacitors to the motor. 1 between the motor terminals, and one from each terminal to the motor casing. But my motor already has a capacitor on it and it still doesn't work. These motors generate a lot of brush noise and usually need the full 3-capacitor treatment for adequate suppression. Why don't you just design capacitors into the shield? They would not be effective there. The noise must be suppressed at the source or the motor leads will act like antennae and broadcast it to the rest of the system. There are a few tools that are required for assembly. None of these tools are included. If you don't have them, now would be a good time to borrow or purchase them. They are very very handy whenever assembling/fixing/modifying electronic devices! I provide links to buy them, but of course, you should get them where ever is most convenient/inexpensive. Many of these parts are available in a place like Radio Shack or other (higher quality) DIY electronics stores. First, check that you have all the parts! Look over the parts list here and shown on the left. Also check to make sure you have the necessary tools for assembly. Place the motor shield PCB in a vise or other circuit-board holder and turn on your soldering iron to 700 degrees. The first parts to go in are the two resistors, R1 (Brown Green Red Gold) and R2 (Brown Black Orange Gold). Bend the resistors so that they look like staples, as seen in this photo. Resistors are not polarized, that means you can put them in "either way" and they'll work just fine. Using your soldering iron tip, heat the resistor wire lead and the metal ring (pad) at the same time, after a few seconds, poke a little solder in so that it melts into a nice cone. Remove the solder and then remove the soldering iron. Do this for all 4 wires. Check your work, you should have clean solder joints. Clip the long leads, just above the solder joint using diagonal cutters. Next place the three yellow ceramic capacitors C4, C2 andC6. Ceramic capacitors are not polarized so you can put them in "either way" and they work fine. Bend the leads out just like you did with the resistors. Solder all 6 wires, then clip them as you did with the resistors. Next is the 6mm tactile switchRESET and the resistor networkRN1. The tact switch is used to reset the Arduino since its not possible to reach the reset button once the motor shield is on. The resistor network is used topull-down the pins on the motor driver chips so that they don't power up the motors before the Arduino sketch tells them to. The tactile switch can go in 'either way'. The resistor network, however, must go in a certain way. Make sure the end with a dot is posititioned so it is at the same end as the X in the silkscreened image of the resistor network. (See picture on left). Flip the board over and solder in the resistor network and switch. You won't need to clip the leads as they are quite short aleady. Next are the three integrated circuits (ICs) IC1, IC2 and IC3. When ICs come from the factory, the legs are angled out somewhat which makes it difficult to insert them into the PCB. Prepare them for soldering by gently bending the legs against a flat tabletop so that they are perfectly straight. The latest kits from Adafruit come with 2 16-pin sockets for the L293D motor drivers. They are OPTIONAL and not necessary for operation. If you are experienced with driving motors, you may want to skip the sockets as the decrease the chips' heat-sinking abilities. ICs must be placed in the correct orientation to work properly. To help with placement, each chip has a U notch at the top of the chip. On the circuit board there is a printed out image of the chip outline and one end has a U notch. Make sure the chip notch is on the same end as the image notch. In this PCB, all are facing the same way. Gently insert the three chips. Check to make sure none of the legs got bent or broken. The 74HC595 goes in the middle, and the two L293Ds go on either side. Solder each pin of the chips. The four 'middle' pins of the L293D motor driver chips are tied to a large heat sink and thus may end up getting 'bridged' with solder as shown in the second image. Next are the three 100uF electrolytic capacitors C1, C3and C5. Electrolytic capacitors are polarized and must be placed in the correct orientation or they could pop! The long leg of the capacitor is the positive (+) leg and goes into the hole marked with a +. The close-up images shown here indicate with hole is the + one. Capacitors are not color-coded. The body color can vary from blue to violet to green to black sobe sure to read the value on the side, don't depend on the color! After double-checking their polarity, solder and clip the three capacitors. These are also polarized so make sure the long lead is inserted into the + hole in the silkscreened image. Solder and clip the two capacitors. Next is the 3mm LED used to indicate motor power. LEDs are polarized, just like capacitors, and the long lead is the positive (+) lead. Make sure the LED is placed correctly otherwise it wont work! Solder and clip the LED leads. Next its time to make the headers for the jumper, servos and arduino. We use one stick of 36-pin 'breakaway' header, and break it apart to make smaller strips. You can use diagonal cutters or pliers to snap off the pieces. Break the 36-pin header into 2 8-pin, 2 6-pin, 2 3-pin and 1 2-pin headers. If you have an NG arduino, you may want 1 6-pin header and 1 4-pin header instead of 2 6-pin headers. The 2 3-pin pieces go in the servo connections in the top left corner. The 2-pin piece goes in the PWR jumper in the bottom center. Also, place the 3 large screw terminals for the motor and external motor-power wires. If you received only 2 and 3-position terminal blocks, slide them together so that you have 2 5-position terminals and 1 2-position terminal. Solder in the 3 pieces of header and the three terminal blocks. Next, place the 8-pin and 6-pin headers into the Arduino board. This will make sure that the headers are perfectly lined up. Make sure the Arduino is not plugged in or powered! Place the motor shield on top of the Arduino, making sure that all the header lines up. Solder in each pin of the header. Now go read the user manual. The Adafruit Motor Shield kit is a great motor controller for Arduino, but it does a little care to make sure it's used correctly. Please read through all the User manual sections at left, especially the section about library installation and power requirements! 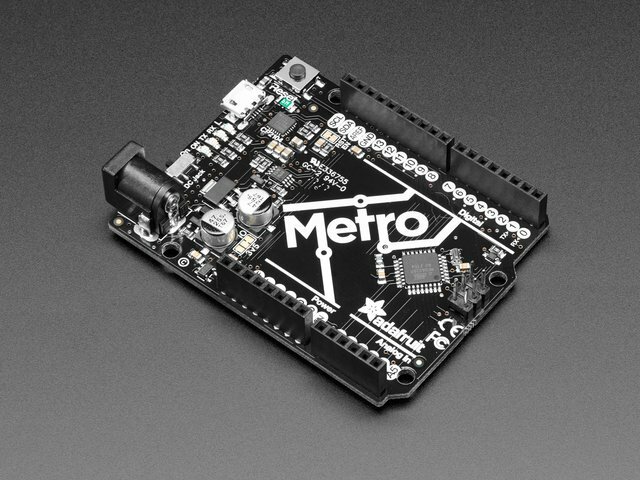 Before you can use the Motor shield, you must install the AF_Motor Arduino library - this will instruct the Arduino how to talk to the Adafruit Motor shield, and it isn't optional! Place the AFMotor folder into your arduinosketchfolder/libraries folder. For Windows, this will probably be something like MY Documents/Arduino/libraries for Mac it will be something likeDocuments/arduino/libraries. If this is the first time you are installing a library, you'll need to create the libraries folder. Make sure to call it libraries exactly, no caps, no other name. Motors need a lot of energy, especially cheap motors since they're less efficient. The first important thing to figure out what voltage the motor is going to use. If you're lucky your motor came with some sort of specifications. Some small hobby motors are only intended to run at 1.5V, but its just as common to have 6-12V motors. The motor controllers on this shield are designed to run from 4.5V to 25V. Current requirements: The second thing to figure out is how much current your motor will need. The motor driver chips that come with the kit are designed to provide up to 600 mA per motor, with 1.2A peak current. Note that once you head towards 1A you'll probably want to put a heatsink on the motor driver, otherwise you will get thermal failure, possibly burning out the chip. On using the SN754410: Some people use the SN754410 motor driver chip because it is pin-compatible, has output diodes and can provide 1A per motor, 2A peak. After careful reading of the datasheet and discussion with TI tech support and power engineers it appears that the output diodes were designed for ESD protection only and that using them as kickback-protection is a hack and not guaranteed for performance. For that reason the kit does not come with the SN754410 and instead uses the L293D with integrated kickback-protection diodes. If you're willing to risk it, and need the extra currrent, feel free to buy SN754410's and replace the provided chips. You can't run motors off of a 9V battery so don't even waste your time/batteries! Use a big Lead Acid or NiMH battery pack. Its also very much suggested that you set up two power supplies (split supply) one for the Arduino and one for the motors. 99% of 'weird motor problems' are due to noise on the power line from sharing power supplies and/or not having a powerful enough supply! Servos are powered off of the same regulated 5V that the Arduino uses. This is OK for the small hobby servos suggested. If you want something beefier, cut the trace going to + on the servo connectors and wire up your own 5-6V supply! The DC motors are powered off of a 'high voltage supply' and NOT the regulated 5V. Don't connect the motor power supply to the 5V line. This is a very very very bad idea unless you are sure you know what you're doing! There are two places you can get your motor 'high voltage supply' from. One is the DC jack on the Arduino board and the other is the 2-terminal block on the shield that is labeled EXT_PWR. The DC Jack on the Arduino has a protection diode so you won't be able to mess things up too bad if you plug in the wrong kind of power. However the EXT_PWR terminals on the shield do not have a protection diode (for a fairly good reason). Be utterly careful not to plug it in backwards or you will destroy the motor shield and/or your Arduino! If you have a Diecimila Arduino, set the Arduino power source jumper to EXT. If you would like to have 2 seperate DC power supplies for the Arduino and motors. Plug in the supply for the Arduino into the DC jack, and connect the motor supply to the PWR_EXT block. Make sure the jumper is removed from the motor shield. Hobby servos are the easiest way to get going with motor control. They have a 3-pin 0.1" female header connection with +5V, ground and signal inputs. The motor shield simply brings out the 16bit PWM output lines to two 3-pin headers so that its easy to plug in and go. They can take a lot of power so a 9V battery wont last more than a few minutes! Using the servos is easy, please read the official Arduino documentation for how to use them and see the example Servo sketches in the IDE. Power for the Servos comes from the Arduino's on-board 5V regulator, powered directly from the USB or DC power jack on the Arduino. If you need an external supply, cut the trace right below the servo pins (on v1.2 boards) and connect a 5V or 6V DC supply directly. Using an external supply is for advanced users as you can accidentally destroy the servos by connecting a power supply incorrectly! When using the external supply header for servos, take care that the bottom of the header pins do not contact the metal USB port housing on the Arduino. A piece of electrical tape on the housing will protect against shorts. For unipolar motors: to connect up the stepper, first figure out which pins connected to which coil, and which pins are the center taps. If its a 5-wire motor then there will be 1 that is the center tap for both coils. Theres plenty of tutorials online on how to reverse engineer the coils pinout. The center taps should both be connected together to the GND terminal on the motor shield output block. then coil 1 should connect to one motor port (say M1 or M3) and coil 2 should connect to the other motor port (M2 or M4). For bipolar motors: its just like unipolar motors except theres no 5th wire to connect to ground. The code is exactly the same. Then every time you want the motor to move, call the step(#steps, direction, steptype) procedure.#steps is how many steps you'd like it to take. direction is either FORWARD or BACKWARD and the step type is SINGLE, DOUBLE. INTERLEAVE or MICROSTEP. "Single" means single-coil activation, "double" means 2 coils are activated at once (for higher torque) and "interleave" means that it alternates between single and double to get twice the resolution (but of course its half the speed). "Microstepping" is a method where the coils are PWM'd to create smooth motion between steps. Theres tons of information about the pros and cons of these different stepping methods in the resources page. You can use whichever stepping method you want, changing it "on the fly" to as you may want minimum power, more torque, or more precision. DC motors are used for all sort of robotic projects. The motor shield can drive up to 4 DC motors bi-directionally. That means they can be driven forwards and backwards. The speed can also be varied at 0.5% increments using the high-quality built in PWM. This means the speed is very smooth and won't vary! Create the AF_DCMotor object with AF_DCMotor(motor#, frequency), to setup the motor H-bridge and latches. The constructor takes two arguments. The first is which port the motor is connected to, 1, 2, 3 or 4.
frequency is how fast the speed controlling signal is. This is the constructor for a DC motor. Call this constructor once for each motor in your sketch. Each motor instance must have a different name as in the example below. freq - selects the PWM frequency. If no frequency is specified, 1KHz is used by default. Note: Higher frequencies will produce less audible hum in operation, but may result in lower torque with some motors. Sets the speed of the motor. speed- Valid values for 'speed' are between 0 and 255 with 0 being off and 255 as full throttle. Note: DC Motor response is not typically linear, and so the actual RPM will not necessarily be proportional to the programmed speed. Sets the run-mode of the motor. The AF_Stepper constructor defines a stepper motor. Call this once for each stepper motor in your sketch. Each stepper motor instance must have a unique name as in the example below. steps - declare the number of steps per revolution for your motor. num - declare how the motor will be wired to the shield. Valid values for 'num' are 1 (channels 1 & 2) and 2 (channels 3 & 4). SINGLE - One coil is energized at a time. DOUBLE - Two coils are energized at a time for more torque. INTERLEAVE - Alternate between single and double to create a half-step in between. This can result in smoother operation, but because of the extra half-step, the speed is reduced by half too. MICROSTEP - Adjacent coils are ramped up and down to create a number of 'micro-steps' between each full step. This results in finer resolution and smoother rotation, but with a loss in torque. Note: Step is a synchronous command and will not return until all steps have completed. For concurrent motion of two motors, you must handle the step timing for both motors and use the "onestep()" function below. Note: The resulting step speed is based on the 'steps' parameter in the constructor. If this does not match the number of steps for your motor, you actual speed will be off as well. Release the holding torque on the motor. This reduces heating and current demand, but the motor will not actively resist rotation. Stepper1.release(); // stop rotation and turn off holding torque. You can grab the latest Schematic, Layout files (EagleCAD format from github. Click the ZIP download button at top middle to download the entire zip. Arduino Stepper/Servo software library with microstepping support. To install, click on Downloads in the middle of the page, select Download as zip and uncompress the folder. Rename the folder to AFmotor (check that the renamed folder contains the .cpp and .h files) and install into the Arduinosketches/libraries folder. For information how to use and install libraries, see our tutorial! This version now works with with the Mega. Public domain! AccelStepper library with AFMotor support. This library allows for advanced stepper control including accelleration and decelleration, and concurrent stepper control! You still need AFmotor above! To install, click on Download in the middle of the page, select Download as zip and uncompress the folder. Rename the folder to AccelStepper (check that the renamed folder contains the .cpp and .h files) and install into the Arduinosketches/libraries folder. For information how to use and install libraries, see our tutorial! This guide was first published on Aug 27, 2012. It was last updated on Aug 27, 2012.